There are a number of connexions between the Thorneycroft family and the Dimmacks, Bagnall and Martens, whose detailed ancestry is discussed on this site. George Benjamin Thorneycroft was the first mayor of Wolverhampton. His wife was Eleanor Thorneycroft (nee Page) and lived until 1874. George Benjamin Thorneycroft had a twin brother Edward Charles Thorneycroft both born in Tipton on 20 Aug 1791, and both of whom went on to become wealthy iron masters. The elder of the two twins Edward married Martha Bagnall the sister of Jane Bagnall, both children of Edward Bagnall of Wednesbury. Jane Bagnall was married to Jeremiah Dimmack and they were the parents of Edward Bagnall Dimmack. It would appear that Jeremiah Dimmack was ‘running’ the Moor Croft Iron works at a time when the 18 year old George Benjamin Thorneycroft was an apprentice there in 1809. Jeremiah was some ten years the senior to his future brother-in-law. In the 1861 census Edward Bagnall Dimmack’s elder sister Mary Ann Bagnall Dimmack is a visitor at Eleanor Thorneycroft’s residence. That confirms the strength of the ties over into the next generation. Both the Thorneycroft and the Dimmack families were keen to repeat the Bagnall name as a middle name in succeeding generations, presumably in respect for the early Broseley iron works of John Bagnall set up in about 1750 and the subsequent firm of John Bagnall and Sons of West Bromwich. Hence Jeremiah’s eldest son was call Edward Bagnall Dimmack. Edward Charles Thorneycroft’s eldest son was called Edward Bagnall Thorneycroft. Edward Bagnall Poulton, the famous Darwinian zoologist, was the daughter of Georgina Selina Bagnall who was another grandchild of the same iron master Edward Bagnall (1761-1805). George and Eleanor’s son Thomas Thorneycroft, a Lieutenant Colonel in the Yeomanry, was an important ironmaster in his own right and allegedly one of the more eccentric residents of Tettenhall, and owner of Tettenhall Towers. Members of his family continue to have mention in our family documents in the 1870’s to the 1890’s. 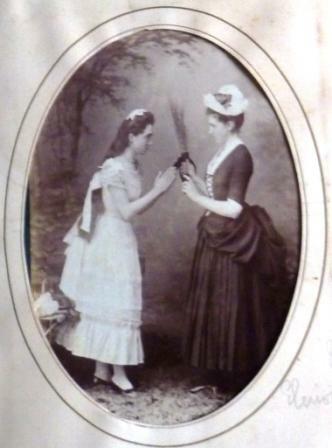 The photograph entitled ‘Eleanor Thorneycroft and Mrs Platt’ must date from about 1879. These two ladies are Thomas’s daughters, Jessie (b1848) and Eleanor (b1857). This family was relatively close to the Martens in the 1860’s and 1870’s – Douglas Thorneycroft, a brother, of the two in the photo attended the wedding of Henry Evans and Florence Marten, presumably as a friend (and distant relation) of the bride. Also on that wedding list are his parents Lt Col Thomas Thorneycroft and his wife Jane.